Beach breaks are perfect for cruise travelers looking for a simple day of rest and relaxation in port. Enjoy a few hours of paradise on one of the many St. Thomas beaches. Beach overcrowded and could only stay for 2 hours, not worth the trouble! We took the Kon Tiki tour. We went to Coki beach which was absolutely packed with people...with 4-5 cruise ships in port...plus any vacationers staying nearby. There wasn&apos;t really enough time in port to look around the island as well as do the beach visit! I saw sea turtles at the beach we were staying at, Maegens Bay, and they take you there on a bus ride after stopping to see an amazing view of the place. In the morning we went to Magans Bay to snorkel. In the morning we went to Magans Bay to snorkel. Not many fish, but a beautiful beach in a quiet cove with calm water. This would be a good family outing. Everything was over priced. Beach staff was not honest with food and beverage prices. Down the beach we found better food and free wifi which they did not make us aware of. Took a cab to Megans bay beach. We did the Secret Sands and Skyline Drive excursion. We did the Secret Sands and Skyline Drive excursion. This our second time doing this excursion. We love the nice, quiet, secluded beach. Very relaxing and you get to see some great scenery aboard the open-air bus there and back. walked out of the port area to find a local taxi to go to Magen Bay Beach...lovely beach, great swimming. With taxi- had to pay for chairs and umbrella hire. With taxi- had to pay for chairs and umbrella hire. No fee for beach. Beautiful amazing beach, early arrival made it most enjoyable. We took a cab to Crown Bay then the ferry to Water Island/Honeymoon Beach (St T, not St J). Kon Tiki Boat and beach excursion. Kon Tiki Boat and beach excursion. It was awesome. Went to Emerald Beach and it was awful, dirty, pit bull dog running around and jumping on your lawn chairs, very aggressive, we left. Took taxi with other cruisers to Magen&apos;s Bay (US$10pp each way). we were taken by taxi to a lovely beach and provided with refreshments while there, it was lovely to see the wild life and scenery. Cheaper than Royal’s cab, we went to Megan’s Bay and chilled by the beach for a few hours. Cheaper than Royal’s cab, we went to Megan’s Bay and chilled by the beach for a few hours. Awesome experience! Just a private taxi and beach break, near services for beer and washrooms. Excellent quiet beach. 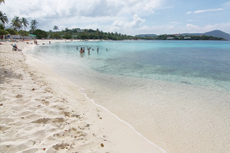 We went to Magans Bay and loved it. Abi Beach was nice. Only a short ride from port - 15 minutes. The facilities was adequate and beach was beautiful. It doesn&apos;t have the best road coming to the beach but it was a fun adventure. MSC Catamaran with Abi beach stop excursion.